Chemical reactions involve interactions between the electrons of atoms. To understand how and why atoms react, we need to know something about electron configuration—;the arrangement of electrons in atoms. Radioactivity involves changes that occur within an atom's nucleus. In this chapter we will go over electron orbitals, electron configurations, the stable octet, and radioactivity. With the advent of quantum mechanics, our understanding of the atom has changed dramatically. An important precursor to the field of quantum mechanics was the atomic theory of Max Planck. He figured out that electromagnetic energy is quantized. That is, for a given frequency of radiation (or light), all possible energies are multiples of a certain unit of energy, called a quantum. So, energy changes do not occur smoothly but rather in small but specific steps. Neils Bohr took this quantum theory and predicted that in atoms the electrons orbit the nucleus just as planets orbit the sun. He proposed the Bohr model of the atom, which was later proved to be incorrect. For the SAT Chemistry Subject Test, you have to know that electrons do not circle the nucleus as planets circle the sun. Electrons do not orbit. Instead, they exist in things called orbitals. Just as a room is a region in a house in which a person may be found, an orbital is a region in an atom where an electron may be found. Rooms come in a variety of sizes and shapes and so do orbitals. 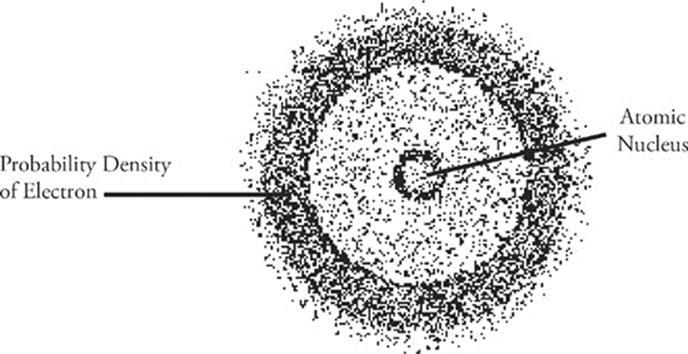 A collection of orbitals with roughly similar sizes constitutes an energy shell. Electrons that are farther from the nucleus have greater energy than those that are closer, so electrons in the orbitals of larger energy shells have greater energy than those in the orbitals of smaller energy shells. Each energy shell is designated by a whole number, so we have the 1st (smallest energy shell), 2nd, 3rd, and so on. Shape is another important characteristic of orbitals. There are four significant types of orbital shapes. Orbitals that have the same shape in a given energy shell comprise a subshell. An s subshell always consists of one spherical orbital; a p subshell always consists of three dumbbell-shaped orbitals, and the d and f subshells contain five and seven oddly shaped orbitals, respectively. Any orbital, regardless of size and shape, can hold a maximum of two electrons. But what's an orbital? The test writers expect you to associate the word orbital with something called a “probability function.” An orbital describes the “likelihood that an electron will be found in a particular location.” Another important concept to know for the test is the Heisenberg principle. What's the Heisenberg principle? Well, simply put, it means this: It is impossible to know both the position and the momentum of an electron at the same time. For this test, all you need to know about Louis De Broglie is that he postulated that matter could have the properties of a wave. He extended this to say that electrons can be thought of as behaving similarly to waves of electromagnetic radiation. 1. The test will give you a periodic table. First, draw these brackets on it. 2. Each period (horizontal row) of the periodic table corresponds to an energy shell. For example, atoms of carbon, C, (row 2) have outer electrons in the 2nd energy shell; atoms of sodium, Na, (row 3) have outer electrons in the 3rd energy shell, and so on. 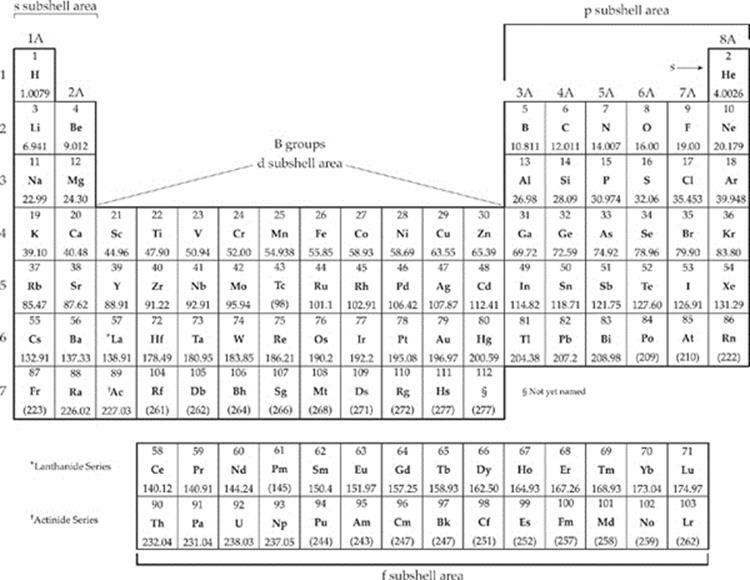 • An element in the s area of row n has outer electrons in the ns subshell. • An element in the p area of row n has outer electrons in the np subshell. • An element in the d area of row n has outer electrons in the (n – 1)d subshell. • An element in the f area of row n has outer electrons in the (n – 2)f subshell. Let's put it all together and try writing the electron configuration for an atom of fluorine. Step 1. Where do we start? At hydrogen, of course. It's in the s area of row 1. Hydrogen (H) has an electron in its 1s subshell. Remember that although helium looks like it is in the p area, it is actually part of the 1s area. Consider an atom of phosphorus, P, (row 3). It's in the p area, so its outer electrons are in the 3p subshell. What about an atom of nickel, Ni, (row 4)? It's in the d area. That means its outer electrons go into the (4 – 1) d or 3d subshell. Step 2. Now we have 2 electrons in the lone orbital of the 1s subshell. Since no orbital can hold 3 electrons, we need to go to a different (higher energy) subshell for the next addition. Step 3. Follow the numbers to lithium (Li) and then beryllium (Be); they're in the s area of row 2 and fill the 2s subshell and keep going. Starting with boron (B) and continuing through fluorine (F), we are in the p area of row 2. Boron atoms have 1 electron in the 2p subshell, carbon atoms have 2, and so on—;up to fluorine, which has 5 electrons in its 2p subshell. Step 4. This makes the electron configuration of a fluorine atom 1s22s22p5. The superscripts indicate the number of electrons occupying a particular subshell. Adding these superscripts gives the total number of electrons in a species. Since fluorine has the atomic number 9, we expect fluorine atoms to have 9 electrons. configuration: 2 + 2 + 5 = 9. Finding the electron configuration of ions follows the same rules as those for atoms but with one additional step. Suppose we need the electron configuration of the fluoride ion, F−. First, find the electron configuration for the atom. That would be 1s22s22p5. Now, how does F− differ from the neutral F atom? It has 1 extra electron. So add 1 electron to the electron configuration. Thus, the electron configuration of F− is 1s22s22p6 (the same as that of a neon atom). If we were dealing with positive ions, we would find the atomic electron configuration and then remove one or more electrons. Now, what about the f subshell, which you might remember learning about in school? For the test you don't have to know much about it. Just remember this: If an element has an atomic number greater than 57, some of its electrons are in the f subshell, which is another way of saying they're in f orbitals. So, element number 76, osmium (Os), has electrons in the f subshell, as do gold (Au), samarium (Sm), and terbium (Tb). One more thing: The Aufbau principle states that a subshell is completely filled before electrons are placed in the next higher subshell. But there are some exceptions to this principle that are worth mentioning. First, since completely filled and half-filled d subshells give extra stability to an atom, chromium (Cr) and copper (Cu) violate the Aufbau principle and promote a 4s electron to the 3d orbital. Second, hybrid orbitals, which we will talk about in the next chapter, also violate the Aufbau principle by mixing orbitals of different energy levels. Look at element 10, neon (Ne). Its electron configuration is 1s22s22p6. Neon's configuration has one 1 subshell and two 2 subshells. It has no 3 subshells or 4 subshells, so the two 2 subshells (indicating the 2nd subshell) constitute its outermost shell. Now take a look at neon's outermost shell: 1s22s2 2p6. Count the electrons in this shell: 2 + 6 = 8. The fact that neon has 8 electrons in its outermost shell means that it has a stable octet: 8 electrons. All of the elements with stable octets are called noble gases or inert gases. They're very stable. They don't like to react with anything or change themselves in any way. They're very happy the way they are. Why? Because atoms are happiest with 8 electrons in their outermost shell. Helium [He, atomic number 2] is also very stable. It, too, is an inert gas although it has only 2 electrons in its outermost shell. The electrons in an atom's outermost shell are called valence electrons. So another way of saying “stable octet” is to say “8 valence electrons.” All of the noble gases have 8 valence electrons. Beryllium, however, (Be, atomic number 4)—;1s22s2—;has 2 valence electrons. Oxygen—;1s22s22p4—;has 6 valence electrons. • Valence electrons are the electrons in the outermost energy shell. • Atoms with 8 valence electrons have a stable octet. They're very stable and are often referred to as the noble gases. Now review the material on electrons, electron configurations, and the stable octet, and try these questions. The answers can be found in Part III. Questions 9–11 refer to the following. Atomic nuclei, as you know, are made of protons and neutrons. In some atoms, the combination of protons and neutrons makes the nucleus unstable. These atoms will decay—;on their own—;spontaneously. As they decay, they emit high-energy radioactive particles. Radioactive particles include alpha (α) particles, beta (β) particles, and gamma (γ) rays. If you think about it, the process of radioactive decay makes sense: A radioactive nucleus is trying to become more stable; greater stability means lower energy, so the radioactive nucleus wants to lose energy. As a radioactive atom decays—;emitting α or β particles and γ rays—;its identity changes, and it becomes either (1) another isotope of the element it originally was or (2) another element entirely. Some nuclei are stable, and some are unstable; the unstable ones have a tendency to break apart, and they are said to be radioactive. Why are some nuclei unstable? For this test, you have to know only that the instability has something to do with the combination of neutrons and protons. Some combinations of neutrons and protons just don't get along well, and they try to solve this problem by undergoing nuclear decay. When you think of radioactivity, think this: When an unstable nucleus undergoes nuclear decay, it's radioactive, and it gives off radioactivity. A Geiger counter is used to detect and measure radioactive particles. You should know about four kinds of radioactive decay. An alpha particle is made up of 2 protons and 2 neutrons. When a nucleus gives off an alpha particle, its atomic number is reduced by 2 and its mass number is reduced by 4. Since the atomic number changes, it actually turns into a different element. After all, the atomic number is the basis of an atom's identity. Another thing about alpha particles: Since an alpha particle consists of 2 protons and 2 neutrons, it's actually the same thing as a helium-4 nucleus, and it's often symbolized that way—; . The 4 represents the mass number, and the 2 represents the atomic number (number of protons). • An alpha particle is emitted. • The atomic number decreases by 2; the mass number decreases by 4. Sometimes a nucleus becomes more stable through beta decay, in which it reduces its neutron-to-proton ratio by taking a neutron and turning it into a proton. In these cases, the atomic number goes up by 1, since there's an extra proton, but the mass number remains the same. (It lost a neutron, but it gained a proton, so there is no net change in the mass number.) When an atom undergoes beta decay, it emits a beta particle; a beta particle is identical to an electron and is symbolized as . • A neutron is converted to a proton. • A beta particle (an electron) is emitted. • The atomic number increases by 1, but the mass number stays the same. Sometimes, when a nucleus can become more stable by increasing its neutron-to-proton ratio, it takes a proton and converts it to a neutron. The result of this is that the atomic number decreases by 1, and the mass number remains the same; this type of radioactive decay is known as positron emission. When a nucleus undergoes positron emission, it emits a positron. What is a positron? Well, it's a positively charged particle, but it isn't a proton. It has the same mass as an electron, but it carries a positive charge. A positron is symbolized as . • A proton is converted to a neutron. • A positron is emitted. • The atomic number decreases by 1, and mass number stays the same. We should also mention gamma rays, which are a form of electromagnetic radiation. Radioactive nuclei often emit gamma rays; these are high-energy particles with the symbol , together with alpha particles, beta particles, or positrons. When nuclei emit alpha or beta particles, they are sometimes left in a high-energy state, but when they emit gamma rays, they become stable. 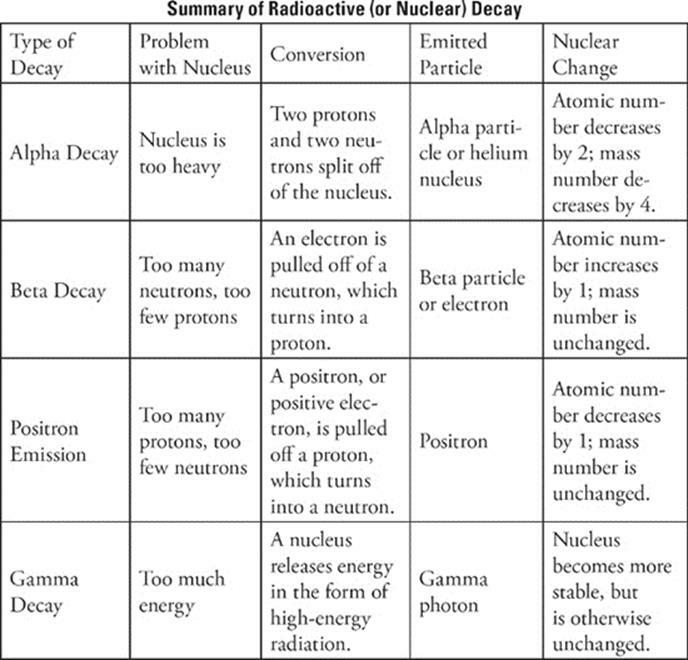 For the SAT Chemistry Test, you should know everything we just said about radioactive decay, and you should also know about the rate of radioactive decay. The rate of radioactive decay of a substance is called its half-life. For example, if we start with 1,000 g of a radioactive substance, and its half-life is 1 year, then after 1 year we'll have 500 g of the original sample left. After another year we'll have 250 g of the original sample left, and so on. That's how half-lives work. Now review everything we've said about radioactive decay and half-lives, and try the following questions. The answers can be found in Part III. Questions 14–16 refer to the following. · The Bohr Model is the incorrect idea that electrons orbit the nucleus like planets orbit the sun. · Electrons exist in orbitals. Their location and movement can never be known with exactitude, but can only be approximated to a degree of certainty with probability functions. · Electrons have properties of both particles and waves, as given by the De Broglie hypothesis. · Electron configurations tell us the energy levels and orbitals that the electrons in a certain atom inhabit. · Valence electrons are electrons in the outermost shell. Atoms with 8 valence electrons are very stable. · Radioactivity is a spontaneous change in the nucleus resulting from nuclear instability. · There are four types of radioactive decay: alpha, beta, positron emission, and gamma. Each results from a different “problem” with the nucleus. 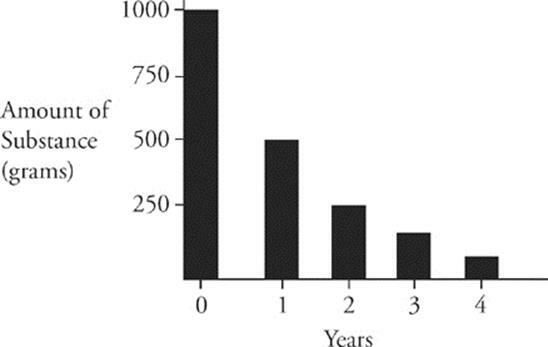 · Half-life describes the amount of time it takes until exactly half of a radioactive sample has decayed.